By John J. Raspanti, Doghouse Boxing: Saul “El Canelo” Alvarez will defend his title for a third time against two-time welterweight champion Kermit “The Killer” Cintron November 26 at the Plaza Mexico in the Distrito federal. The 32-year-old Cintron (33-4, 28 KOs ) feels his experience and ring savvy will be too much for the 21-year-old titleholder to withstand. "It's been a while since I've worn a world title belt around my waist and I can't wait to do it again in November,"said Cintron. "Alvarez is a good, young fighter, but I have the experience and the power to beat him. I know this fight is in his backyard, but I won't need judges for this one." Alvarez smiled when he heard Cintron's comments. Alvarez (38-0, 28 KOs ) claimed the vacant 154-pound belt with a one-sided 12-round decision over Matthew Hatton. In June, he followed up the Hatton triumphant with another dominant performance. The youngster from Mexico dismantled and stopped game Ryan Rhodes in the 12th and final round. In his second defense, Alvarez struggled at times with Alfonzo Gomez before TKOing him in the sixth round. The fight was part of a HBO-PPV split-site fight card with Floyd Mayweather and Victor Ortiz being the other main event. Cintron won his first 24 fights until he faced nemesis Antonio Margerito in April of 2005. Margerito withstood Cintron’s powerful punches and floored him four times on route to a fifth round stoppage. Cintron regrouped and was victorious in his next five fights (including winning the IBF welterweight belt) until facing Margerito again in 2008. This time Cintron lasted a round longer until a wicked body shot put him down for the count. In 2009, Cintron battled to a controversial draw with middleweight title holder Sergio Martinez. Three months later he won a decision over slugger Alfredo Angulo. In May of 2010, he met Paul Williams in Carson , California . The fight had just begun to heat-up when Cintron lost his balance and fell through the ropes, landing on a table. In pain Cintron wanted to continue but the ringside physician thought otherwise. The fight went to the scorecards. Two of the three judges gave Williams the technical victory by split decision. Cintron took 14 months off to regroup. He was back in the ring in July of this year to take on young Carlos Molina. Molina won an upset 10-round decision. Cintron looked slow and ring worn. He returned to action a month later and methodically defeated Antwone Smith in Saint Charles , Missouri . The victory didn’t put a stop to the whispers that Cintron is an “old” 32. Alvarez will be giving up three inches in reach and two inches in height on November 26. Though undefeated, there are many who consider him an over publicized media creation. Alvarez began his professional career at 15 years old and was fighting 12-rounders three years later. His record shows he defeated Jose Cotto, former welterweight champion Carlos Baldomir, and Lovemore Ndau. This is a trap fight for Alvarez that could depend on which Cintron shows up. If the Cintron who labored in his last two fights appears, Alvarez will prevail. 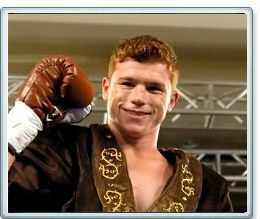 However, if the former champion manages to turn the clock back to 2009 then Alvarez could be in trouble. Alvarez has youth and speed on his side while Cintron has faced the tougher opposition. Despite Cintron’s recent mediocre performances, the Houston-based Puerto Rico native is still a step-up for Alvarez. His boxer-puncher style could give the hometown hero some problems. It's hard to go against a champion fighting in his homeland especially one as popular as Alvarez. The fight will be a competitive one, but Alvarez should find a way to prevail late, or by decision.